Located in South West England, Accidental Books Ltd is an independent publishing house. 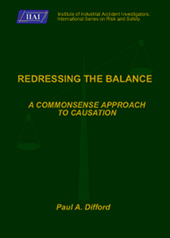 "Redressing the Balance - A Commonsense Approach to Causation"
2. that such accidents always have multiple causes. This book exposes the fallacy of those beliefs and disproves the theories upon which they are based. It identifies numerous errors that ultimately lead Petersen (1971) to propose an ill-founded theory on Multiple Causation as well as the flawed reasoning behind F. Bird Jnr’s (1974) ‘updated’ Heinrich sequence. The book also deconstructs Reason’s (2004) so-called Swiss Cheese Model to reveal that the model and its central premise are, and always were, contrary to empirical data, science and logic. Agencies such as the UK Health & Safety Executive (HSE) were quick to adopt the Bird (1974) and Reason (1997) type causal philosophy and continue to encourage others to do likewise. However, Difford (2011) shows that the HSE’s causal assumptions are wrong and that the HSE’s own data is contrary to the philosophy that it supports and promotes.